The greatest benefit in building a custom home is that you have the luxury of designing and building your home exactly the way you want it. Jim Joyce Homes LLC builds quality homes that are designed and built based on a combination of your needs, desires and in accordance with your budget. The key to Jim Joyce Homes LLC’s success is the ability to balance your needs and wants with your budget using a 10-step process. The Initial Consultation Questionnaire helps to communicate your basic needs and desires to the builder. A great website for collecting house plan ideas is www.coolhousplans.com. This website allows you to filter through house plans based on style, square footage, number of rooms, lot size and dimensions, etc. Two great websites for collecting ideas on features for your home are www.pinterest.com and www.houzz.com. Both websites offer unlimited ideas on everything from design to space savers and organization. Both websites allow you to become a member for free. The membership allows you to store all of your design ideas in one place. It is very important to have a clear understanding of your budget up front. This will assist in balancing your dreams with reality. If you are planning on getting a loan, it is strongly recommended that you get pre-qualified before proceeding to Step 2. If you do not already have a lender, Step 7 provides some helpful hints to consider when selecting one. During the initial consultation, Jim Joyce will personally sit down with you to discuss your criteria for the location of your home site, if not already identified. Second, he will discuss in detail your desired needs and wants in a house plan. Third, he will discuss your budget and provide information on financing options. And finally, he will explain the custom home building process and answer any questions you may have. To make the initial consultation most efficient, please bring the items listed in Step 1. Hard copies of the house plans and pictures that reflect the features you like. The estimated budget for your custom home. Will the building pad require dirt removal, replacement or fill? What type of soil is on the lot? Are there drainage issues or is the lot in a flood plain? Are there any easements or setbacks that place limitations on the dimensions of the house plan? Are there HOA requirements or restrictions? Is water and sewer available to the property? Are utilities such as phone, cable, gas, electricity available? Are there any noise issues that need to be minimized by the design/layout of the house plan or alternative construction methods? The next step is selecting an Architect/designer to assist you in creating a house plan that best suites your needs and desires. Many Architects/designers provide outstanding designs but not all are familiar with the associated construction costs in building the design. Jim can provide recommendations of Architects/designers who work closely with him to design a house plan that is in line with your budget. This will ultimately save you time and unnecessary frustration. The cost for a design using Jim’s recommended Architect/designer is as low as $1,200 but depends on the size and complexity of your home. Jim will provide the Architect/designer with the information needed to begin working on the Preliminary Design. Once the design is complete, a meeting will be setup for you to review the design and provide feedback. Once the requested revisions to the Preliminary Design are made by the Architect/designer, you will be provided with a Final House Plan Design. Once the house plan is finalized, Jim Joyce Homes LLC will complete a detailed specification list, bid and contract. These documents will be sent to you for review, approval and signature. Following the funding of your loan, pre-construction activities will begin on your home. As construction of your home progresses, the bank will use a Draw Schedule to pay the builder. A Draw Schedule basically outlines the milestones that must be completed by the builder prior to getting paid by the lender. The Draw Schedule is also used for cash purchases. Once the contract is signed and the loan is funded, pre-construction activities begin which include the permitting process and obtaining approvals from local authorities and the Home Owners Association, if applicable. Following these approvals, site preparation begins which may include: soil testing, water and/or chemical injection, grading and excavation. Pre-construction is followed by the construction of your home. Construction typically follows this sequence, but may vary slightly, depending on weather conditions, material availability/delivery and labor schedules. 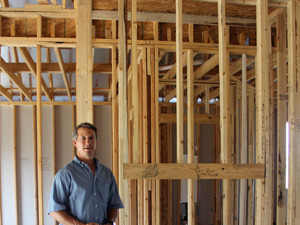 Following construction, Jim will meet with you to present the completed home and perform a final walk through. Upon your acceptance of the home, the title company is notified and a closing date is set. Once all documentation is complete, you are provided the keys to your new custom home and final payment is provided to Jim Joyce Homes LLC.